Raw milk has been gaining popularity recently, especially by those that prefer natural and organic food products. The public in general still believes raw milk to be very dangerous and unhealthy compared to pasteurized milk. Let's look at some information. Raw milk is simply milk that hasn't gone through the processing that regular milk is subjected to. Raw milk is not pasteurized, not homogenized, and is obtained from cows that haven't been given any chemical growth hormones or enhancements. By way of reminder, pasteurization is the process of heating milk to kill bacteria and homogenization is the process of breaking up milk fat into smaller particles to prevent separation in the carton. As an interesting side note, the breakage of fat molecules by homogenization makes them small enough to pass through the intestinal wall and straight into the bloodstream. Un-homogenized milk has the normal size fat molecules, which are too big to pass into the blood, keeping the fat and cholesterol out of the arteries. As we covered in the last post, pasteurization is only somewhat helpful in destroying harmful components in the milk. In addition, the FDA's health and cleanliness requirements for dairies that produce raw milk are considerably more strict than dairies that produce pasteurized milk. So, arguably, raw milk is cleaner to begin with, so the lack of pasteurization is less of a concern. A number of vitamins present in raw milk are destroyed or damaged by pasteurization. Vitamin A is completely destroyed, vitamin B is weakened, and vitamin C is severely diminished. In fact, infants fed exclusively on pasteurized milk will develop scurvy. Raw milk is not without its share of downsides, though. It is still plagued by the same problems we've discussed in previous posts, such as unusable calcium, diseases, and yucky stuff. In addition, as proponents of raw milk will tell you, since the milk is not pasteurized, it carries higher risk of containing dangerous bacteria. Generally, this is not a very large risk, since the cows are generally cleaner and healthier in general. This, in addition to the stricter cleanliness standards, means that raw milk isn't all that dangerous. The bottom line is that while raw milk is considerably healthier than standard, pasteurized milk, it's still milk from another species that humans were never intended to consume. It is just as dangerous as pasteurized milk when it comes to things like heart disease, osteoporosis, allergies, etc. 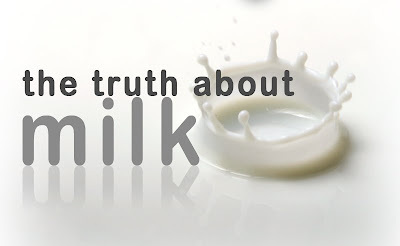 However, if you're someone who simply can't live without milk, I encourage you to research raw milk as an alternative.